The lifeblood of the southern states are the Aquifers! What and where are the Aquifers? 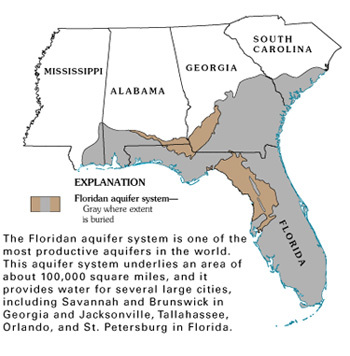 The principal artesian aquifer is the largest, oldest, and deepest aquifer in the southeastern U.S. Ranging over 100,000 square miles (260,000 km2), it underlies all of Florida. The aquifer developed millions of years ago during the late Paleocene to early Miocene periods, when Florida was underwater. Wakulla Springs in Wakulla County is one of a number of major outflows of the aquifer with a flow rate of 200–300 million US gallons (757,082 – 1,135,623 cubic meters) of water per day. A record peak flow from the spring on April 11, 1973, was measured at 14,324 US gallons (54,220 l; 11,927 imp gal) per second – equal to 1.2 billion gallons (4,542,494 cubic meters) per day. Groundwater in the Floridan aquifer is contained under pressure by a confining bed of impermeable sediments. When the water pressure is great enough, the groundwater breaks to the surface and a spring flows. Water temperature and flow from a Floridan spring are relatively constant. In general, as water flows through the Floridan aquifer system, the water quality becomes more alkaline and the sulfate content increases as does the amount of dissolved solids.